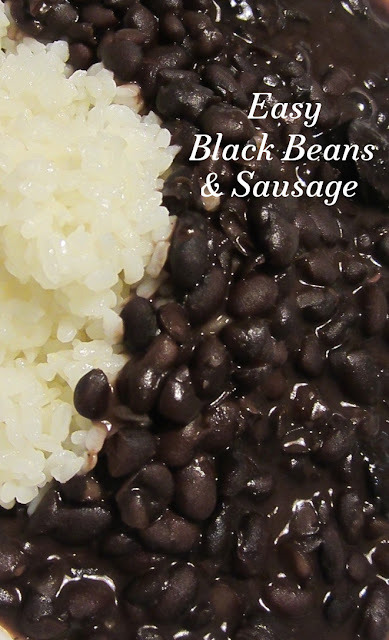 A traditional meal in the Carioca, that is to say Rio de Janeiro - area of Brazil, black beans with smoked sausage and rice is a tasty staple that will fill you up and bring you comfort. Moving on is about discovering new places and making new friends. But it is also about finding homes in your new house for memorabilia and treasures from past lives. I have always told my girls that home is where we are together. But, for me, home is also where the special things are. My mother and my mother-in-law are both collectors of treasure. I saw their houses from a young age (yes, I was friends with my mother-in-law before I started dating her son) and, while the things they had amassed were beautiful, I vowed quietly to myself that I would be more cautious. I would choose a piece or two from each place we lived and make that piece count. I don’t mean to imply that all of their things weren’t special, just that I was looking for a simpler, less cluttered life. Our first overseas move was Singapore but we didn’t get a shipment and, frankly, we had all kinds of furniture already from the Far East since dear husband came to the relationship with Korean hibachi tables and Chinese cabinets with tiny drawers, a carved wooden Indian room divider screen and even a big Chinese gong. Our second posting was Sydney and we bought one item: an antique over-mantel piece with a small stained glass cabinet. It cost as much to ship back to the US as it did to buy it. Worth ever penny. Our purchases in the next location, Abu Dhabi, were primarily Persian carpets. The first was a 3ft x 5ft Tabriz that cost us US$800. A fortune in those days, the last of the ‘80s, for two kids just out of university a few years. The carpet had an identical twin, very unusual, and it is one of our regrets that we didn’t buy them both. But, Lordy, $800 for one! Two was unthinkable! We still kick ourselves over that decision, almost 30 years on. We moved around for the next few years, judicially, carefully, adding “recuerdos” to our collection. An antique Dutch clock in Balikpapan, Indonesia and a small elegant chandelier from the Marché aux Puces in Paris. Then for five and a half years we called Brazil home. Early on, I saw a dish I wanted, coveted in Biblical proportions. I confess that sin. Although I guess, technically, it did not belong to my neighbor. Instead, it was at a pottery shop, an hour or two from my house, en route elsewhere, so I wasn’t tortured unduly. This dish was large! Almost 24 inches from end to end, in a big, brightly colored, hand-painted oval design of peaceful blues and greens. Boy, did I want it. But we all have limits on what we will pay for something. This dish, more that 20 years ago, was beyond my comfort zone at US$100, especially for something decorative, because I could not imagine ever baking anything in a dish so large and pretty. So I went back occasionally to visit it and lusted. Through those years, and the magic of devaluation the real fell to almost 50 percent of its initial inflated value and, just before we moved from Brazil, the dish was mine. It has had pride of place in our living room since then. The movers in Kuala Lumpur were simply not careful enough in packing this up for our move to Egypt. When my heart is heavy, I cook. The only meal appropriate after the discovery of the devastation was black beans with sausage and rice. I had to celebrate Brazil and bring back a happy memory because this one was so painful. Yes, I know it was only a thing, but it represented so much more. A wish fulfilled, a country missed. In Brazil, beans and rice accompany almost any other dish that might be served. Lasagna for dinner, also beans and rice. Fried chicken, beans and rice on the side. Grilled meats, bring on the beans. We found it most extraordinary when we arrived, but we came to realize that unless there were beans and rice to fill you up, it just wasn't really considered a complete meal there. To serve: White rice cooked following package instructions or your favorite method. 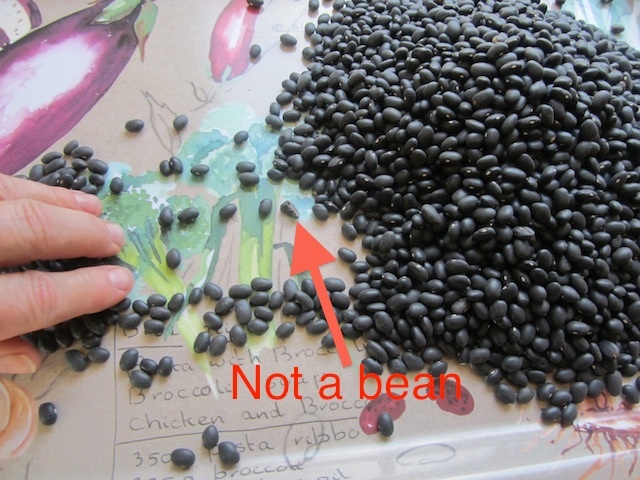 Pick carefully through the dried black beans removing any stones or clumps of dirt. Even the best brands have them, so do not skip this step. Best case scenario if you miss a clump, is gritty beans. Worst case scenario if you miss a stone is a trip to the dentist with a broken tooth. All the stones and clumps I found, with one bean for comparison. Rinse the beans with some warm water and drain. Slice the sausage into 1cm or 1/2 inch rounds. Add the beans, garlic, bay leaves and sausage to your pressure cooker. Eye the pot and add twice as much cold water as you have beans. Add about a teaspoon of salt and a good sprinkle of both peppers. Some smoked sausages are saltier than others so we don’t want to add too much actual salt right at the beginning. N.B. If you are watching your salt intake, wait till the beans are cooked to add the salt. For those who don't use much salt, the seasonings from the sausage may be enough for you. Put the lid on the pressure cooker and heat on high until it starts to make that loud ch-ch-ch noise that means it is boiling and under pressure. Turn the heat down till the ch-ch is just a gentle chug of a slow train. Cook like this for about 35-40 minutes and then remove the pressure cooker from the heat. Allow it to cool until it is safe to open. Give the beans a good stir. Put the pressure cooker back on the stove on a medium heat, without the lid, and cook to reduce the liquid by one or two inches or two to four centimeters and to finish cooking the beans. Add them into the pressure cooker and stir vigorously to incorporate them. This will thicken the bean mixture. Check the seasonings and add more salt and pepper if necessary. Serve over white rice with hot sauce on the side for those who want some extra spice. We were blessed in the last two locations to have our daughters attend two of the best schools in Southeast Asia. Both ISKL – the International School of Kuala Lumpur - and SAS – Singapore American School – are part of an intercollegiate league called IASAS. This dish brings back happy memories of hosting IASAS friends and players when we were living in Singapore. It’s quick and so delicious. I think the last time I served it was for a softball/baseball exchange or perhaps even tournament and we had a house full up to the rafters. Along with a bunch of girls from JIS in Jakarta (one of them a former ISKL student whose mother also stayed with us), we had one ISKL team member’s mother, father and sister staying with us too. So many people to feed and I was in my element. But after working all day at the SAS Booster Hut, selling food and spirit wear with my fellow Booster Club moms, I couldn’t have a complicated meal waiting to be prepared at home. This quick salmon tikka, adapted from Jamie Oliver’s Ministry of Food, was perfect. I made it again last night, but with homemade naan. You can find that recipe and those instructions here. It was just as tasty as I remembered. 1 heaped tablespoon curry paste – almost any one will do. In these amounts, you can feed two. Multiply this as many times as is necessary for your crowd. Preheat your oven to 110°C or 225°F. Pop your naan into the oven to warm through. Or, if you have time earlier in the day, make them fresh yourself. It’s easy and homemade are so much tastier than the store bought. Again, complete instructions are right here. First, the raita. Halve your cucumber lengthways, and then halve it again. Use a sharp knife to cut off the watery seedy part. Chop the cucumber diagonally into about 1/2 inch or 1cm pieces. Put them in a bowl with room to stir. My helper and I share the inside seedy bits. One for him, one for me. Until they are gone. Then he loses interest in helping and I get this face. Finely chop your chili, cilantro and green onion. Add them to the cucumber bowl. Halve your lime and squeeze the juice from one half into the bowl. Add a good sprinkle of salt and pepper and the cumin. Mix well. Now add the yogurt. Give it a taste and if you would like the raita spicier, add some cayenne pepper and add more salt, if necessary. Slice each salmon fillet across lengthways into four equal slices. Thinner is easier to accomplish if the salmon is slightly frozen. Jamie’s original recipe calls for skin-on salmon. I choose to take the skin off mine by slipping a sharp knife between the skin and the flesh (skin side down on the cutting board) because 1. I find it very difficult to cut through the skin, especially when I am trying to cut thin slices and 2. I like to fry it up crispy, sprinkle it with sea salt and eat it just like that. Delicious. Spoon the heaped tablespoon of curry paste into a small dish and loosen it with a little drizzle of olive oil. Use a pastry brush to spread the paste all over each piece. Heat a large non-stick frying pan over a high heat. Once hot, put the salmon into the pan and cook for about 1½ minutes on each side, until cooked through. Serve on the warmed or fresh naan, topped with your cucumber raita and a squeeze of juice from the other half of the lime. We folded ours up like tacos and ate them with relish. Do lean over your plate though, because these can get drippy. Warm, homemade griddle naan, made from a yeast dough. It's better than store-bought any day. Yes, yes, I am aware that if naan is said with the proper aahh sound for the As, that title doesn’t rhyme for us Americans. Still couldn’t resist. Pretend you are Queen Elizabeth II (God bless her in her 60th year of queenship!) and now, it rhymes. This recipe is so easy that, time available for rising and what not, there is no reason to buy naan pre-baked in a store to reheat. You can have soft, tasty naan right in your own home. Will it taste like it was baked on a hot stone or brick oven? No, but neither does that store-bought stuff. I can promise you that it will be delicious. And, like all bread, it smells heavenly while you cook it. In a large bowl, dissolve yeast in warm water. Let stand about 10 minutes, until frothy. Stir in sugar, milk, egg, salt, and enough flour to make a soft dough. You may not use all of the flour. Knead for 6 to 8 minutes on a lightly floured surface, or until smooth. Place dough in a well-oiled bowl, cover with a damp cloth, and set aside to rise. Let it rise 1 hour, until the dough has doubled in volume. Punch down dough. Pinch off small handfuls of dough about the size of a golf ball. Roll into balls, and place on a tray or plate. Sprinkle lightly with flour. Cover with a towel, and allow to rise until doubled in size, about 30 minutes. During the second rising, preheat non-stick skillet or pancake griddle to high heat. Warm your oven and put a tray inside for your naan to stay warm on after you cook them. I also add a bit of tin foil so I can fold it over the naan just a little bit. Roll one ball of dough out into a thin circle.Lightly brush the surface with the butter.You will want to stretch this as much as you can because it tends to shrink back up when it hits the pan. Place dough in pan, buttered side down and cook for 2 to 3 minutes, or until puffy and lightly browned on the bottom. Brush uncooked side with butter, and turn over, and cook until browned, another 2 to 4 minutes. This is the first side down. This is the second side down. I turned it back over so you could see. Remove from pan and place on warm tray in the oven. Continue the process until all the naan has been prepared. These are wonderful served with potato curry, salmon tikka, Burmese curry or Tarka Dal.